As part of my slow remodel of my main bathroom, the Broadway style vanity light was next to go. I was down to three out of six globe bulbs and didn’t want to waste money on replacement bulbs. I had found the Artika Subway LED Vanity Light at Costco last year and it has been replaced this year by a smaller and brighter light from a different manufacturer (Celeste from Innova Lighting, 2700 lumens). The electrical box in my bathroom is offset from the center of the mirror and vanity so I needed a light that would cover it and not look odd. I initially ordered a Mirrea 16W LED vanity light from Amazon.ca but it wasn’t bright enough. 16W is equivalent to a 60W incandescent bulb. I found the Artika Subway at Costco.com It is specified to be 1700 lumens which is equivalent to about 110W incandescent. When it arrived, I plugged it in temporarily to check the brightness and it seemed adequate. The fixture is also glass so a bit heavy. It came with a 24″ mounting plate where I drilled extra holes to feed the wire from the box which in my situation is offset from the center. I also drilled extra holes so I could mount directly to the studs instead of using the included hollow wall anchors. With it installed, it is more than bright enough for a small bathroom and almost covered the old light completely. If it ever dies, it is going to be a pain to replace the entire unit. I am finding these lights a bit too bright (especially late at night) so I am going to replace the wall switch with a dimmer. The costco.com website indicates these lights are dimmable. As part of my basement reno, I needed a solution for the bathroom door that swung inside a small bathroom. With the limited space, a pocket door would be ideal but would require reframing the opening. I found a solution in the Johnson 2610F Wall Mount rail kit which converts any door into a externally mounted sliding door. I bought the 7ft version on Ebay . The longer length can be cut down with a hacksaw. The important dimension is the door should be at least 1-1/4″ wider than the opening. I used the existing door though it is a little bit too narrow which meant the door could come off the bottom plastic guide when closed. The length of the track should be at least double the width of the door. Installation is pretty straight forward and they have a video on youtube. I was able to get inset handles that fit the existing knob holes and i plugged the latch hole with a cut piece of wooden broom handle. The hinge mortises I filled with cut ends of a 2×4 which was close to the hinge dimension. Since I have fairly thick molding around the door, there was a bit of a gap between the door and the frame so I added weatherstripping to the inside frame. For a privacy lock, I installed a sliding latch on the inside frame with the bolt extending into the door when closed. In an emergency, the door could be opened by removing the screws in the plastic guide rail at the bottom and tilting the bottom of the door out. During the reno of my basement, I heard a loud buzzing coming from a bedroom and I suspected it was the doorbell transformer. Since they are typically mounted to an electrical box for AC power, I disassembled the ceiling light and found two wires coming from a knockout on the top of the ceiling box. I disconnected the wires and the buzzing stopped but my front door bell was also dead. I determined I would have to cut out the drywall to repair or replace the transformer and since I planned on painting the ceiling, there wasn’t a reason not to fix it. Cutting a hole large enough to access, I took a pic with my cell phone to determine how the transformer was mounted. A screw was expanding a collar connecting the bottom of the transformer to the ceiling box. Once I had the transformer out, I could see the problem. It looked like when it was originally installed, it was missing a rivet at the top holding the plates together. The installer just put a nail into the hole and bent it to hold it together. I headed to Home Depot to buy a bulk nut and bolt for around $1, fixed the transformer, reinstalled it, and patched the ceiling. My brown 60’s bathtub was in need of a replacement. The problem I had was mainly the colour of the tub and some rust on the outside lip. The grout had a bit of mildew in spots and I was worried it was coming from behind the wall. The ugly floral tiles and seashell soap holder tile also needed to come down. I had replaced the shower valve with a pressure balanced one previously (no more blasts of hot water when someone turned on a faucet or flushed a toilet. See post here. The next step was to replace the bathtub (before the floor and vanity). To minimize plumbing, I wanted a replacement bathtub close to the height and drain location close to my existing tub. Most tubs carried in big box stores are “above floor drain”. These tubs are higher to allow the drain pipe to run above the floor where the floor can’t be cut out such as in concrete condos. The only model I could find close to my original tub was the Bootz Aloha carried at Home Depot in the US. The Canadian version was an above floor model. Thinking I would need to rent or borrow a truck to bring it back, I measured the box and determined it would just fit into my hatchback so my first hurdle was solved. I had looked into bathtub reglazing and research indicated it only lasts about 5 yrs. I did find an epoxy painting product but for both, the cost would almost be the same as a new tub. The next design challenge was choosing a backerboard. The best and most economical solution I found was Densshield which is a drywall product coated with a waterproof layer. I did my research and read and watched a few installation videos on youtube. One feature I did want to add was a shower niche. I looked at buying a pre-built niche and ended up building one with 2×4’s and densshield. With densshield, the face is waterproof but the edges are not. In their videos and instructions, they recommend using polyurethane sealant or silicone to seal joints. I picked up Sikaflex sealant from Home Depot for this application since thinset would more easily adhere to this. For the tiles, I wanted something that wouldn’t look dated in 10 yrs. Though larger tiles are more modern, subway tiles tend to be timeless. I settled on 6×8 tiles and 2×2 green glass tiles inset in a diamond pattern for a small design feature. I purchased these at Lowes since they are sold individually there. My friend came over to give me a hand with the demo and tub installation. Hammering out the tile, the area behind the tub was dry and mold free. To remove the tub, the drain had to be unscrewed out. I had purchased a drain wrench but it wasn’t really needed and a pair of slip-joint pliers could be used by sticking the pliers inside the drain. With the tub removed, there was a bit of a time capsule in garbage the original installers left inside the old tub cavity. There was an old pepsi bottle, boxes from some of the bathroom accessories and leftover mosaic tile from the original walls. I considered using some of the original tiles in my design but couldn’t really fit it in. I took the old 60lb steel tub to the metal recyclers and got a whopping $2 for it. The drain pipes in my 60’s house were 1-1/2″ copper using compression fittings for the tub drain. When we dry fit the tub, the drain location was about 1/2″ off and we were able to line it up by angling the drain pipe. The overflow pipe was too long so I cut it down and used a Fernco fitting to reattach it which also gave it some play to line up properly. The shower valve also no longer lined up to the center of the new tub but it could easily be moved since the copper pipes have a bit of play when not attached to the framing. When I replaced the drain, I didn’t tighten it enough nor did I check it adequately for leaks so I had to replace some wet drywall on the ceiling downstairs. There is a good youtube video on installing the Bootz tub from the manufacturer though they don’t recommend any product names. With 6×8 tile, I wanted the niche to fit four of these inside so I made the niche 12×16 which could hold several soap and shampoo bottles. A minor problem arose since an electrical cable ran in the area where the niche was going to be built. Luckily, there was enough slack in the wire after some clips were removed for the wire to go around the niche. I had to be careful with the measurements since I wanted a full tile at the bottom edge of the niche and it had to be centered. I picked up the Densshield at Lowes and it comes in 60″ x 32″ sheets which is perfect for surrounding a 5ft tub. However, I needed a little bit extra for the sides of the niche and the area beside the bottom of a tub. You should get a 4″ x 32″ strip left over with the two sheets on the main wall. Instead of buying and wasting an extra sheet, I cut strips from the top of the sheet opposite the shower head. This area would be the driest and would rarely be in contact with water. One question was how to install the Densshield over the bathtub lip. I left a 1/8″ gap (spaced with a nail) and also used 2×4 blocking where possible to give both the lip and Densshield and edge. In hindsight, I should have used a minimal gap like 1/16″ since it is hard to fill a larger gap with the sealant. For screws, a box of 200 1-1/4″ Rock-On backerboard screws was enough for this project. Screws were set every 6″ following the instructions since it has to hold a lot of weight with the tile. I put Sikaflex between the butted joint on the wall, the inside corner joints, over the screw heads, and the exposed edge of the Densshield along the bathtub lip. I also sealed all the pipe openings and the edges when I lined the niche with Densshield. There are youtube videos where they use a paint-on waterproofing membrane like Aquadefense or Redguard on the edges but those are not available in small quantities and Sikaflex should work just as good. The Sikaflex does take a couple days to cure so I covered the walls with dollar store shower curtains since I needed to use the shower while it dried. After it was dry, I reinforced the joints with cement board tape and modified thinset. There is also a good youtube video from the makers of Densshield on the installation process. The tile count is for 10 rows x 4 for each side wall and x 6 for the front wall with the ends using 6×6 tile. The 10 rows didn’t quite reach the old tile height so I added a row of tiles cut in half so I needed an additional 7 – 6×8 and 2 – 6×6. I got lucky and found a used tile saw on craigslist for $20. I did want to buy a used one since I wanted to take my time and not be rushed with a rental saw. For a decorative feature, I bought some square 2″ glass tiles and would embed these in a few corners in a diamond pattern. The first row is the most important and needs to be level. Don’t count on your tub being level. You do want the widest gap to be minimal since it has to be covered with a bead of caulking. I had originally bought tile adhesive which had indicated it was good for wet areas. After some online research, I returned it and switched to using modified thinset. For caulking, it is recommended to use 100% silicone with mildew protection for bathrooms. I used GE Silicon II which has a short handling time. I took my time and tiled over several days. For spacing, I used the nubs built into the tile instead of tile spacers. With both the densshield and sikaflex, I knew my walls were waterproof behind the tile. To cut the tile for the openings, I used both a circular tile cutter I purchased at Harbor Freight and the tile saw. Since the wall was not perfectly plumb, I did a lot more tile cutting than I had originally planned. I had some leftover grout and the online MAPEI grout calculator indicated I should have enough with an extra 1 lb. Grouting is pretty basic but a little tedious so I worked in sections. I also wanted to make sure the colour matched my tile when it dried. I did contemplate sealing the grout but didn’t do this extra step. One thing I didn’t want was an ugly shower curtain with my new bathtub and tile walls. I was looking into a glass screen but found a modern, frameless sliding shower door at a local importer of Chinese made building products. The door is thick 8mm tempered glass but instructions were minimal other than an autocad drawing. I installed the fixed glass panel first determining the position with the plastic guide that installed in the middle of the tub wall. Though the instructions were to screw it in place for an acrylic tub, I just siliconed it in place. From the position of the panel, I could mount the edge frame and screw it into the wall. Holes were easily drilled into the tile with a new masonry bit and some tape on the tile to minimize the bit from wandering. With the fixed panel in place, I could then install the top rail since it is attached to the fixed glass panel. The allen key for set screws for the rail supports were not included but luckily I had a correct metric key in my tool box. During my update of all my brass door hardware inside the house, I also updated my front door lock and deadbolt. Since I wanted to use my existing Weiser keys, I purchased a Weiser front entry knob and deadbolt with their Smartkey system. The Weiser brand is used in Canada while Kwikset is used in the US. The first issue encountered was that the Weiser locks used thinner keys so my old keys could no longer be used. However, the Smartkey was very easy rekey both locks to match my new keys. Second issue was that when I went to Home Depot to get some more duplicate keys, they didn’t work. Comparing the new and original keys, they did appear to match. I ended up taking both the lock and keys back to Home Depot to get them re-cut and the new ones worked fine. For the entry knob, my old lock had a push and turn system which made it very easy to both lock and unlock. The new knob used a small round turn switch which was relatively more difficult to both lock and unlock. The only advantage of this switch is the ability to lock the knob from the outside with the key. In both designs, you can lock the door without a key (which is required with the deadbolt). After my update, I did find out there are vulnerabilities with the Smartkey system. They can be opened with a special tool fairly easily. You can find articles and videos on youtube if you search. I am not really concerned because if someone wanted to break into your house, they would get in and I also have my monitored alarm system. Floors squeak due to floor boards that are nailed to joists becoming loose over time. Newer construction techniques use glue and screws to minimize squeaking. After watching “Ask This Old House”, they featured a repair system with a depth guide and screws with break-away heads called “Squeeeeek-No-More”. I picked this product up in Home Depot in the US for $20 in the carpet section of the store. The hardest part of the repair is finding the joists. The instruction manual suggests going 9″ over from a wall and assume that joists typically run in the direction of the shorter length of a rectangular floor plan on 16″ centers. The kit includes a special screw with a hex head and long straight shank to help locate joists. My subfloor is constructed with diagonal 1″x 6″? boards with plywood on top (original wood floors removed) and then underlayment and pile carpet. I found it pretty hard to find the joists and initially the joist was running the opposite angle I had assumed. Even after locating the joist (the screw will stop spinning), the squeaks were improved but not eliminated. I found with pile carpet, I could use trimhead 3″ screws instead of the Squeeeeek-No-More screws. 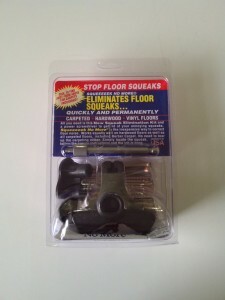 I will be returning the system and have given up on fixing the squeaks until I replace the carpet. 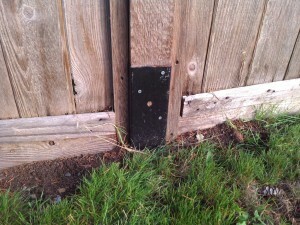 One side of my fence has been deteriorating for years and leaning towards my side of the property. When I was out of the country, my friend came over and propped them up with some 2×4’s to keep it from falling. 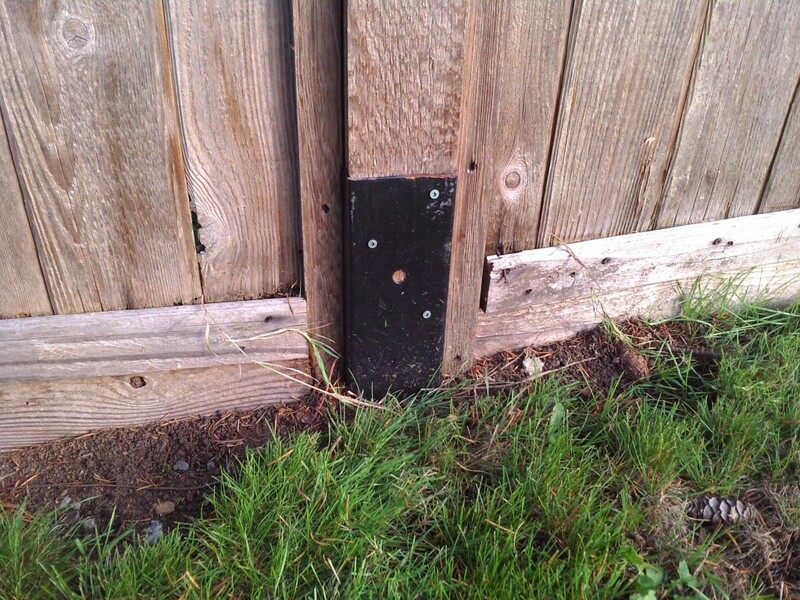 The posts appear to be set in dirt and not concrete so the proper repair is to replace them which would require rebuilding the entire fence. You can actually pour the cement mix dry and water it after which makes it a bit easier. I came across the Simpson Fence Mender at Home Depot in the joist hangers section. I bought one to try it out since they were relatively inexpensive. The instruction indicate it should be installed in pairs but I figure a single one should improve the post. The instructions indicated you should hammer on the indentation to drive it down but it is kind of hard to hit it with a mallet. I just used a scrap piece of wood and pounded it from the top keeping it as close to the post as possible. It actually worked pretty good and it was secure enough to remove the bracing and I bought a second one for the neigbouring post. Browsing Home Depot, I found some 12mm laminate flooring for $1/sq ft. This was a good deal since thick flooring is better and usually more expensive. Though my upstairs needs new flooring, I didn’t want a patchwork of different flooring styles but will probably stick with carpet in the living areas and use plank vinyl in the bathroom and kitchen. The upstairs addition is carpeted and gets dirty from the sliding door entry and I’ve also used the room as a work space. I bought enough laminate to cover the addition, the foyer and stairs. In the addition, I considered leaving the baseboards up but the correct thing to do was to remove and reinstall them. At my parents, “professional” installers left the baseboards and then added quarter round moulding to cover the gap leaving a less finished look. I borrowed a portable table saw, a chop saw and a laminate cutter. The cutter was probably meant for thinner laminate since the cuts weren’t very clean with 12mm laminate so I didn’t use it. When sawing, the good side should be UP when using the table saw or chop saw to minimize chipping the surface. Next I had to decide if I wanted to use underlay. Since I was installing on plywood, it wasn’t really necessary but would give the floors a softer feel. I picked some up at Rona. With the carpet up, I notice quite a draft coming from one outside wall by the floor. I noticed the entire wall had been shimmed up about 1/4″ causing a major draft. I didn’t have any expanding foam insulation so just used a large amount of caulk to try to seal the air leakage. Back to the flooring. For the first row, the tongue on the plank needs to be ripped off. The thickness of the last row also needs to be estimated at this time since you don’t want a 1″ sliver on your last row. A gap needs to be maintained on the edges to allow for expansion which would be covered by the baseboard. The instructions indicate joints must be more than 6″ apart so the trick is to stagger the rows while minimizing waste. I’ve seen installations where the joints on every other row line up and it doesn’t look very natural so I wanted a fairly random stagger pattern. For the last row, you should measure the thickness at both ends of the plank since the area may not be perfectly square. I had to redo one plank because of this problem. Also, I needed to cut around a door jamb to slide the laminate underneath. A borrowed oscillating saw was the perfect tool to make the cut. With the floor installed, I replaced the molding and caulked the gaps but didn’t realize I had accidentally purchased clear caulk instead of white since it only dries clear. Just a minor mistake. In the entryway, I first removed the existing tile which had been laid on the original vinyl floor. I contemplated ripping up the vinyl but decided against it. In the entry way, you do have to worry about the laminate getting wet since water could damage it so I had some tile carpet that I used to rest shoes on. For the stairs, hardwood nosing would cost about $10 a step while the whole step could be replaced for $30 so I decided against using laminate on the steps. Replacing the steps will be another future project.